"Do not only draw what you see," encourages artist Gary Rudisill (p55), "create what you feel." 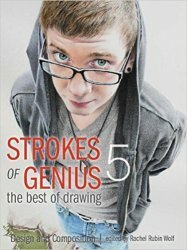 In Strokes of Genius 5, that feeling is delivered through strong and inventive design. Covering a tantalizing range of styles, the work within illustrates the many ways today's best artists choreograph shape, value, line, texture and color into compositions that create drama, tell a story, and pull viewers in. Featuring unusual perspectives, tantalizing contrasts and other dynamic design elements, Strokes of Genius 5 delivers fresh inspiration for artists of every skill level and medium. Art and inspiration from 91 contemporary masters in charcoal, pencil, pastel, colored pencil, scratch board, pen and ink, and more. 120 masterful works--landscapes, figures, portraits, urban scenes, animals and still lifes--in a wonderful diversity of styles. Expert tips, techniques and stories behind the designs.